Doctors Without Borders/Médecins Sans Frontières (MSF) teams organized quickly to provide aid in Nepal after the first earthquake. 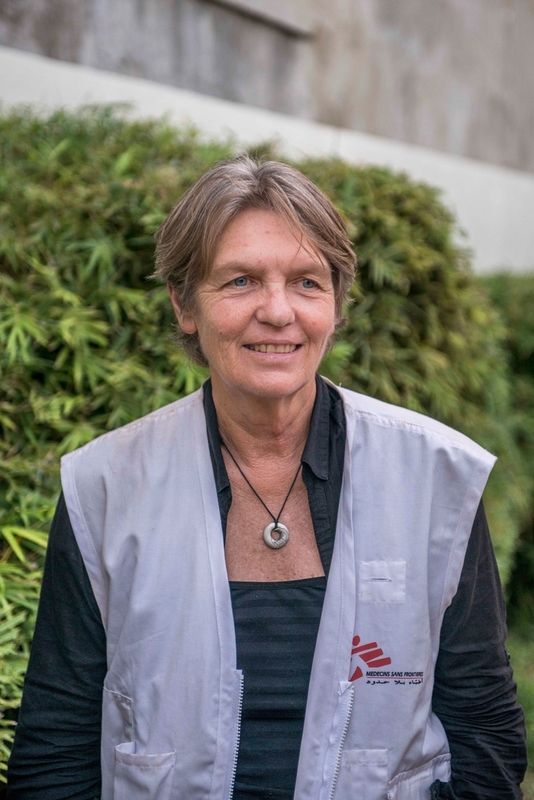 Ann Taylor, MSF head of mission, explains how assistance was deployed after a second quake struck the country. Is the situation returning to normal? We feel the earth moving almost every day. These are aftershocks of the 7.8 magnitude earthquake that struck Nepal on April 25. However, on May 11, there was a jolt that was nearly as strong—7.3 on the Richter scale. Everyone is afraid. Today, I was at the Kathmandu orthopedic hospital, where we will be working. I did not see any patients entering the hospital buildings. All the patients are outside. These people, who were injured during the quakes and underwent orthopedic surgery, are hospitalized in tents. However, because of lack of space, some are in beds under plastic tarps or shade netting. Given the situation, the first thing we managed to do was provide tents. This week, we set up two large tents that can house 50 patients and we are going to add a 70-patient tent. The Kathmandu orthopedic hospital has an operating room that could function quite well, but no one wants to go there. To prepare for the risk of new jolts, surgery is performed outside under a specially-furnished tent set up on the hospital grounds. It’s going fine. The needs focus on post-operative care, which will be central to our work. A physical therapist will work with patients on their rehabilitation. We will set up a special tent for physical therapy and a psychologist will provide support to earthquake victims who need it. Is the population experiencing widespread fear? Yes, people are traumatized. They are afraid. On May 11, the day of the second earthquake, people panicked. Those who were inside houses fled, running, and those nearby also fled, running. They are fully aware of the risk of remaining inside a building. I was in Arughat, in Gorkha district, where many houses were severely damaged. I saw walls that were still standing, but they are cracked and at risk of collapse. What assistance can MSF provide in this situation? In the mountainous regions, the residents of isolated villages have received almost no aid. Only the wounded were transferred to hospitals by the army for treatment. Many roads are cut off and helicopters are the only way to reach these high-altitude villages. On May 21, a logistics team landed in a village in the Arughat region (Gorkha district) to distribute hygiene kits including buckets, soap, towels and detergent. A medical team accompanied them and will hold consultations. The helicopter had to come back several times to deliver the hygiene kits. The two teams will go to different isolated villages. The operation will begin again next week, with the distribution of tents, blankets, and jerry cans, because 80 to 100 percent of the houses in this area were destroyed. People are sleeping outside and need shelters. It’s pretty urgent, as the monsoons will start soon. This helicopter operation will also allow us to refer patients to our hospital in Arughat, if necessary. It includes an operating room, a labor and delivery unit, and an emergency room. We set up and opened this 20-bed hospital on May 8, but patients still face considerable difficulty moving around the country.